This is the ninth course in the 11-part series of Building a Community-Based Palliative Care Program. You can take this single course or the entire series. Fee-for-service billing under Medicare is unlikely to generate sufficient revenue to sustain your community-based palliative care program. 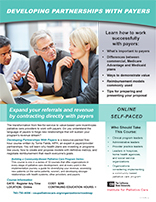 In this course you will learn how to develop partnerships with payers and at-risk health systems, speak their language, craft a convincing proposal, and negotiate rates that can create a consistent revenue stream for your palliative care program. In addition, partnerships can provide a strong referral base of patients who otherwise may not have benefitted from your program’s services. Developing Partnerships with Payers is a resource-packed five-hour course written by Torrie Fields, MPH, an expert in payer/provider partnerships. You will learn the payer’s rationale for developing a partnership to provide palliative care, and language to include in your business case to help you secure a contract. Information on how to present a compelling case to payers to expand access to your services and negotiate reimbursement for your services is also presented. In addition, the course includes several resources including a glossary of terms and the downloadable Community-based Palliative Care Return on Investment Calculator so you can demonstrate the potential ROI of your program in a language that payers understand. Download the brochure for this course. Developing Partnerships with Payers consists of four separate modules each focused on a critical aspect of payer relationships. Describe ways to identify the subset of the population with whom you’d like to begin a program or pilot with your health plan. Identify how to find associated costs and potential savings for those patients you have identified as potential participants in the program. Describe the metrics to include in your proposal to a health plan and the value behind them. Describe the different types of reimbursement models most often used by health plans when working with providers. Select the reimbursement model most appropriate for your program or project. Apply your chosen reimbursement model in a business case within the proposal to your health plan. Torrie leads the development and implementation of programs and processes at Blue Shield of California and Care1st Health Plan that work to improve the quality of life for individuals with serious or life limiting illness and their families. Torrie has most recently worked as the program director for palliative care at Cambia Health Solutions and as a consultant for health plans, purchasers, and educational institutions to assist them in understanding the impact of palliative care on the medical system. Torrie led the development of highly successful palliative care initiatives including benefit design, case management, caregiver support, medical home development, and policy and engagement efforts.